This is the latest installment in an ongoing series of quarterly video ecosystem overviews focusing on monetization, audience, platforms and content. Our goal is to provide a summary of key developments each quarter on a need-to-know basis. Digital video remains a bright spot in the US ad spending economy. 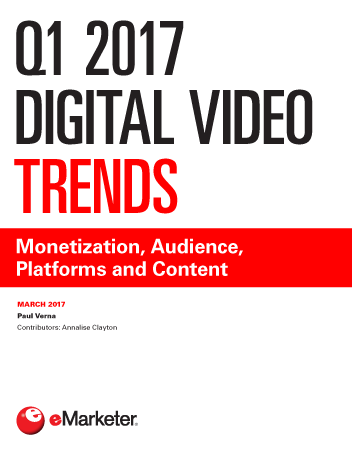 Video is expected to be the only growth category among display formats this year, and its projected growth exceeds that of search. Furthermore, a rising percentage of US video ad dollars are being transacted programmatically. The number of US digital video viewers will increase through at least 2021, with growth rates slowing as the sector approaches saturation. At the same time, pay TV subscriptions are continuing a long downward trend. Social and messaging platforms are vying for video ad dollars. Facebook and Snapchat are pushing hard into areas such as live video, premium programming and connected TV. Meanwhile, full-episode players are building on their strengths, venturing into new areas such as live TV. The number of scripted TV series rose in 2016, extending a stretch that has seen the total more than double over seven years. However, last year was the first time all of the increases came from streaming video services as opposed to traditional channels. "US digital video viewers are a mature, nearly saturated category: More than four in five internet users will watch digital video this year. The number of viewers will continue to grow—albeit more slowly—through at least 2021."